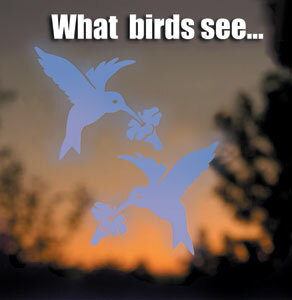 All about Window Hummingbird Feeders. 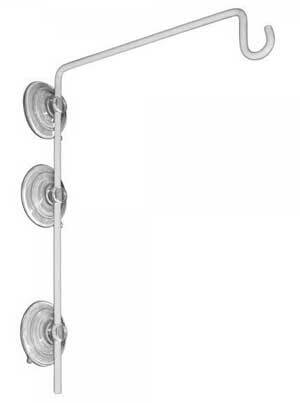 Most feeders come with suction cups which attach to the glass of a window. My favorite window feeder comes with supply suction cups and screws. The screws present another option for mounting the feeder. I have a window feeder attached with screws onto the outside window sill in front of our kitchen sink. With the feeder attached outside to the window sill, I am able to open the window, reach out, and easily remove the nectar reservoir for cleaning and refilling. This feeder also comes with an ant moat around the reservoir which is filled with water to prevent insects from crawling into the nectar reservoir. The moat can also be refilled through the window as the water naturally evaporates. I pass the time waiting for and viewing the hummingbirds that show up at the feeder while completing this chore. 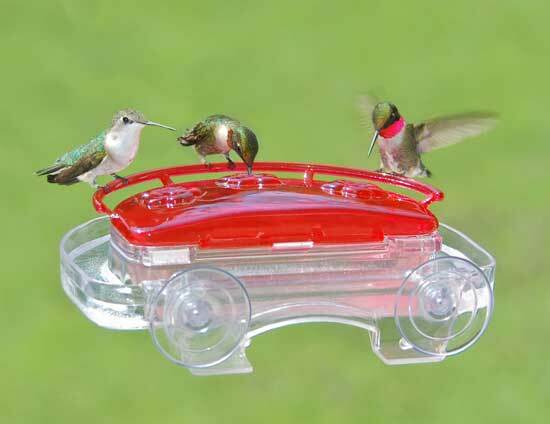 See my Review of this Jewel Box Feeder. 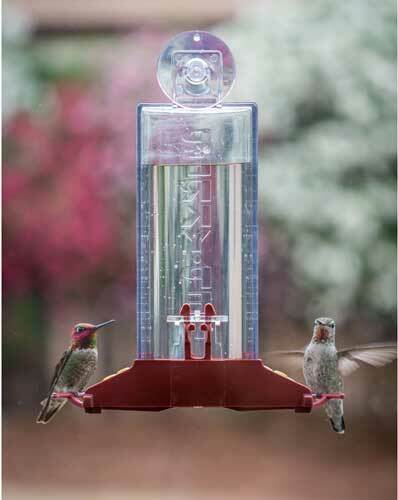 Another option for a window hummingbird feeder is to convert a regular basic feeder or tray feeder by hanging the feeder from a decorative hook which is mounted outside to the side or the top of the window. Again, with this setup you will have to go outside to remove the feeder for cleaning and refilling unless you can reach it from an open window from inside. With this suction cup mounting system you will have to go outside to refill the nectar reservoir. 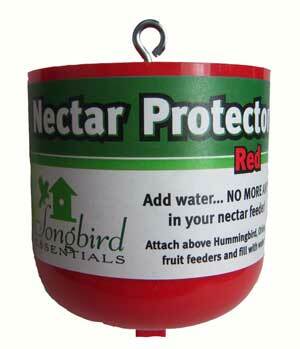 If you hang a feeder on a hook, I strongly recommend the use of a portable Nectar Protector ant moat because insects will scale the wall of a house, slither down the hook onto the feeder, and ultimately into the reservoir of nectar. I have witnessed a single file army of ants stretching from the ground, up the wall, onto the hook, and down the feeder into the reservoir. While one line marched to the nectar, another line of troops returned from the feeder, to the ground, to the nest..
An ant moat which is filled with water will prevent this since ants can't swim and therefore gain no access to the nectar. What I have observed: in rare cases a hummingbird will fly into a glass window pane, seeing the space behind the window, but not seeing the glass. There are Window Decals available that stick to the glass. The decal looks to be a solid barrier to the hummingbirds but is translucent from the inside, so viewing the feeder is possible. An up close and personal encounter with your hummingbirds!